The first picture is so gorgeous! I can't get over the lighting; just lovely. I absolutely adore this shoot. It's one of the best of yours I've seen yet, Roz. There's such a haunting atmosphere, yet tranquil at the same time. Unlike Ms. Havisham, it's as if you were a bride who had had a happy marriage, but with a forlorn cast. A couple of the photos, especially the last one have a beautiful sense of you, as a spectral bride, beckoning the viewer to come see the enchantment of the Isle. I love it. I hope you are well these days since your surgery! If you like the character of Havisham, read the poem by Carol Ann Duffy (we studied it in school but it's a good enough poem that I didn't end up hating it). Beautiful dress and I love the setting. Oh gosh, what a travesty if the government sell off forests. That would be truly awful. It is so grand of you to go through the trouble of finfing the perfect location. Most of us are reduced to a corner in our back patio. 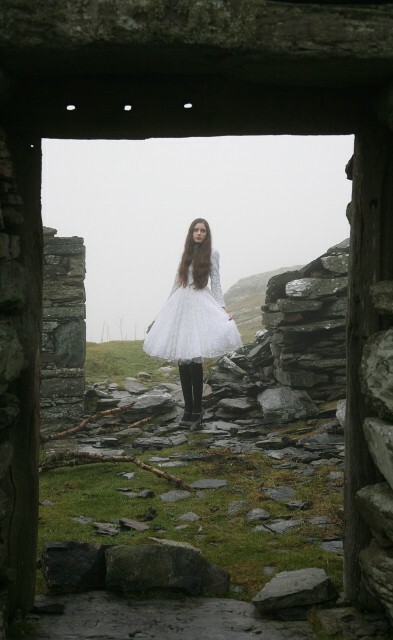 The mist, the dress, your long hair...Wow it is like a fairy tale Dickens or not. I am so glad you are going slowly back to your normal routine. I absolutely adore this post! The background is stunning like always and so is the dress! The layers just make it so special! You definately picked the perfect backdrop! You raise a very important point Roz, this goverment would tax the air too I am sure, utterly disgusting - though I fear any party elected would be equally bad. I do adore Mrs Havisham she must be one of my favourite characters, I liked the more recent fil with Gweneth Paltrow, the Mrs H was excellent in that - famous lady I cant think of her name! I think this is one your most beautiful posts yet. The mist really makes it spectacular, as does the dress. And I quite agree-they should not sell off forests no matter what. That dress and the images are absolutely gorgeous- I particularly love the one with the dress in swishing motion! These pictures are stunning! I really love that dress. It looks so mystical! Your photos are absolutely stunning! Gorgeous- easily mistakeable for a mag editorial, IMO. Beautiful dress with amazing scenery, loving these images! LOVE that first one of you in the doorway! Gorgeous!! This is quite the picturesque photo shoot indeed! These are probably my favorite pictures you've ever taken. Everything about them is gorgeous! And I'll confess that I never finished Great Expectations, but I did read parts of it, and I can definitely tell how much it inspired this shoot. This post is wonderful. The outfit is gorgeous, and your blog is so professional. These photos are really gorgeous!! Beautiful photos as always! So eerie, etheral. Love, love, love! Oh wow. I am amazed of those pics.. I've been really looking for inspiration and here it is! I'm new to your blog and think you look absolutely fantastic-paticularly this post-I love the white dress. It's all the more inspiring to me because one of my friends also has scoliosis, and so seeing how you've recovered and are now back at school (I looked some posts back obviously) is so reassuring! sorry if this comment comes up twice but it doesnt seem to have gone through. I'm totally new to blogging and also new to your blog, but I just wanted to say how inspiring it is to me and its even more doubly so because one of my friends has scoliosis (I'm guessing thats what you had from the mentions of your back, comments etc) and its so lovely and reassuring for me to see how you've recovered! Your backdrops never cease to amaze me, really making the most of our beautiful countryside.. and the dress is magical. as you say, they'll soon think of something else to sell off, whilst big companies dodge taxes and get richer and richer. Wow, you're stunning, these pictures are beautiful! i'm totally with you about the govervenment decisions, but we're being through some hard times, they say.let's see. I sooooooo envy you the beautiful natural backdrops of your photos!!! This whole shoot is looking so very editorial!!! You absolutely look the part, dear girl...........& that lace dress is an awesome pick, I must say! Pretty pictures. Happy new year from Norway! Amazing pictures. Such a beautiful setting and the mist really does create an atmosphere. I completely agree with you about the cuts- it seems so unfair to take such lovely landscapes as this away from public eye only to be seen by birds and animals. The misty, eery atmosphere really works for this outfit Roz, you really look like you've stepped out of the 19th century! Love the Mary Janes too. you look so classic and beautiful! love the dress! That dress is gorgeous! And the setting is magical. Beautiful pictures I absolutely love the first one! The light is so pretty and where you are and you outfit.....everything just works, magical! You look like a pre-Raphaelite, a young girl by Rossetti, it's stunning! Lovely photos, and what a lovely dress! Great Expectations is one of my favourite novels, although it is a bit heavy going. Your dress also reminds me of the dress Cecilia wears in The Virgin Suicides (another great book). Beautiful dress! And you look just like a model! pure. classic. clothes cameras and coffee. back to business. if the business is creating dreamy photoshoots of gorgeous atmospheric beauty. Did your mom shoot the pics? If so, I am starting to see a style, a bit different from your pops come out. Wonderful shoot. You look freakishly lovely, and I'm glad that you are back to normalacy, if you want to call school normal, I guess. Ah, air: we've already commodified water, air is sure to be next! i LOVE the first and last picture - the light, the landscape, your dress, it's all perfect. it's one of my favourite shoots from you! Love, love, love this whole photoshoot. Location, lighting, clothes. AMAZING. My favourite shots are the ones in the doorways and where you twirl. I would love to have a dress like that, but I probably wouldn't rock it like you. you are soooooo beautiful !! that will be terrible if the UK govt sells off forest land! surely they can come up with a better way to generate revenue. now on to your photos- you look like a ballerina or fairy princess!! the fifth pic is my favorite, dress caught in motion. the photos are dreamlike! such soft misty light. i love that. wishing you a smooth transition at school, roz. amazing photos ! the dress is so beautiful ! wow you look absolutely gorgeous, that is an amazing dress. Those photos are totally MESMERIZING!!! My jaw dropped! AMAZING! What a fantastic set of photos. Not only do you look great but the mist is really something!! I think you have very haunting eyes.. very unique and beautiful. This setting suits you so well! Beautiful photographs, beautiful dress. I love how the misty landscape compliments the lacey dress. It's just so editorial, lovely and elegant! There is nothing I can say that can descibe the beauty of these photo's! The dress is stunning and the background is so mysterious and serene it's unreal.